Spring is in full swing, which makes this the perfect time for the return of the Landmarks Bike Tour! Landmarks is proud to partner with UT's Orange Bike Project (OBP) again this year to provide docent-led bike tours of the collection. The two-hour, two-mile adventure will begin at OBP's headquarters in the ground floor of the 27th Street Garage. 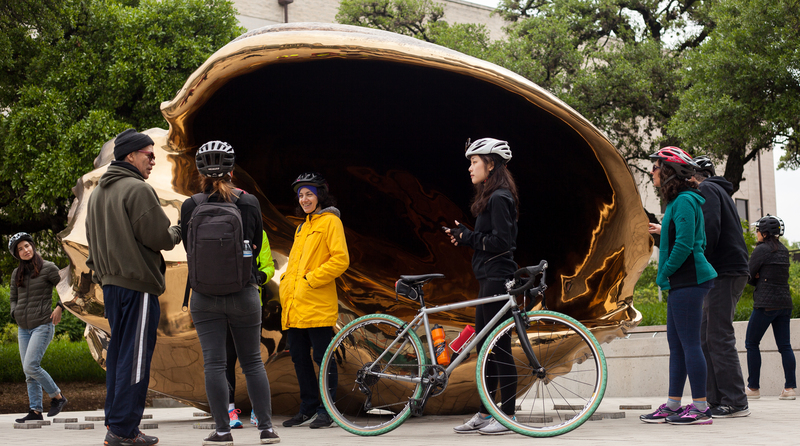 The group will bike through campus with a guide and a Landmarks Docent and explore public art at The University of Texas at Austin. This tour is a fun way to see campus, talk about art, and enjoy the weather. The ride will be at a leisurely pace! Need a bike? Rent one with OBP for $15; student rentals are only $5. Rental includes a helmet and bike lock and is good for 24 hours so you can explore even more of UT or central Austin on your own. Have your own bike? Meet the group at OBP and join the tour for free! Ample parking is available on the street or in the 27th Street Garage. Space is limited! Reserve your spot by Friday, 4 April at landmarks@austin.utexas.edu.